This article was originally published by War on the Rocks on 9 June 2015. Since World War II, however, U.S. leaders have reversed course and signed defense pacts with more than 60 countries. As a result, the United States is legally obligated to defend a patchwork of nations that spans five continents, contains 25 percent of the earth’s population, and accounts for nearly 75 percent of global economic output. To what extent does this massive commitment entangle the United States in wars it would otherwise avoid? This is a pivotal question for U.S. foreign policy — and one that increasingly divides U.S. policymakers from many of the nation’s most prominent international relations scholars. U.S. political leaders almost uniformly support allied engagement, and President Barack Obama recently reaffirmed U.S. commitments to defend allies during crises between North and South Korea, Iran and Israel, Russia and Ukraine, and China on the one hand and Japan and the Philippines on the other. A growing number of scholars, however, argue that such commitments are dangerous and should be abandoned. According to these scholars, America’s alliances are not assets but rather “transmission belts for war” that “risk roping the United States into conflicts over strategically marginal territory.” Several scholars even compare the U.S. alliance network to the tangled web of European security commitments that helped catalyze World War I. To avoid getting sucked into foreign wars, these scholars argue, the United States should scale back its alliance network or scrap it altogether — measures that, if implemented, would constitute the biggest shift in U.S. grand strategy in two generations. Are these fears of entangling alliances warranted? To find out, I analyzed every U.S. military conflict since 1948 (the year the United States signed its first peacetime alliance) and asked a basic question: To what extent was U.S. involvement driven by formal alliance commitments? The results, which are published in an article in International Security, are surprising: U.S. entanglement almost never happens. Over a 65-year period in which the United States had more than 60 formal allies, there have been only five ostensible episodes of U.S. entanglement — the 1954 and 1995/96 Taiwan Strait Crises; the Vietnam War; and the interventions in Bosnia and Kosovo in the 1990s — and even these cases are far from clear-cut. In each case there were other important drivers of U.S. involvement, U.S. policymakers carefully limited support for allies, allies restrained the United States from escalating its involvement, the United States deterred adversaries and allies from escalating the conflict, or all of the above. Against this limited evidence of entanglement, I find many cases in which alliances restrained the United States, or in which the United States restrained its allies or sidestepped costly commitments. I only examine U.S. military conflicts and therefore cannot evaluate fully the prevalence of such cases of peace, but even within my biased sample, there are at least four cases in which alliances prevented U.S. escalation, and another seven cases in which the United States reneged on security commitments and/or restrained an ally from attacking a third party. Of course, the United States has fought alongside allies on numerous occasions. But in most cases, U.S. actions were driven by an alignment of interests between the United States and its allies, not by alliance obligations. In fact, in many cases, U.S. policymakers were the main advocates of military intervention and cajoled reluctant allies to join the fight. At worst, therefore, alliances have had a mixed effect on U.S. involvement in military conflicts — some alliances at times have encouraged U.S. military involvement, others have discouraged it, and some have simply been ignored by U.S. policymakers. 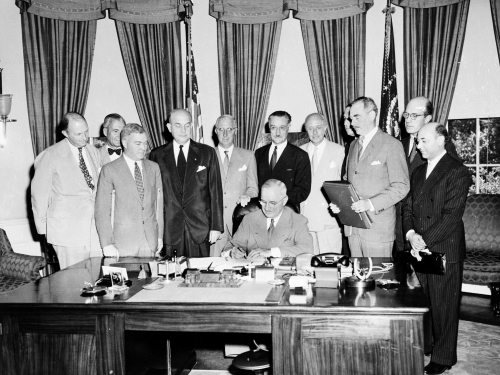 The risk of entanglement is not trivial, but historically, U.S. policymakers have managed this risk by inserting loopholes into alliance agreements, shirking costly commitments, maintaining a diversified alliance portfolio that generates offsetting demands from different allies, and using explicit alliance commitments to deter adversaries and restrain allies from initiating or escalating conflicts. Ultimately, this indicates that allied engagement does not preclude, and may even facilitate, U.S. military restraint. When the United States has overreached militarily, the main cause has not been entangling alliances but rather what Richard Betts calls “self-entrapment” — the tendency of U.S. leaders to define national interests expansively, to exaggerate the magnitude of foreign threats, and to underestimate the costs of military intervention. Scrapping alliances will not correct these bad habits. In fact, disengaging from alliances may simply unshackle the United States and enable it to intervene recklessly abroad while leaving it without partners to share the burden when those interventions go awry. A better route to a disciplined defense policy would be to (1) bolster congressional constraints on the president’s ability to send U.S. forces into battle; (2) develop guidelines governing the use of force and make them the centerpiece of national debate before every potential military intervention; and (3) retain allies, who can provide U.S. leaders with a second opinion on the merits of potential interventions, political cover when U.S. leaders decide not to intervene, and troops, supplies, intelligence, and money when the United States does intervene. In short, military restraint is best pursued through allied engagement, burden-sharing, and domestic reform — not retrenchment. To be sure, some security commitments may need to be revised or dissolved for specific reasons. But history shows that most allies most of the time help keep U.S. troops at home by bearing some of the burden of U.S. wars and by encouraging the United States to stay out of wars altogether. Large-scale retrenchment would sacrifice these and other benefits of alliances while doing little to compel U.S. leaders to define national interests modestly or choose military interventions selectively. How to avoid foolish wars and achieve strategic solvency will continue to be the subject of debate, but those debates will be more productive if they focus on domestic culprits rather than foreign friends. Americans tend to blame their military misadventures on allies, but the blame for these debacles, and the responsibility for avoiding future fiascos, lies at home. Michael Beckley is Assistant Professor of Political Science at Tufts University. This article is based on his study “The Myth of Entangling Alliances: Reassessing the Security Risks of U.S. Defense Pacts,” published in the Spring 2015 issue of International Security.